Sound artist, field recordist , photographer and lo fi video maker, Punck is the pseudonym chosen by Adriano Zanni, for his experimental music project. He creates his sound canvas manipulating many different kinds of acoustic, concrete and natural sources with audio editors and softwares. 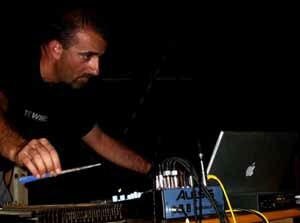 He participated to many experimental music festivals in Italy and nowadays he keeps to privilege live activities. During his sets he uses laptop, portable CD players, various objects and selfmade videoclips. Among his many collateral activities, we can't help to mention that he’s owner of Ctrl+Alt+Canc, a net-label dedicated to experimental music of all kinds that has released many works of artists such as Logoplasm, Sawako, Ernesto Rodrigues, Ovo and Sinistri.